Slightly better than it was before, Sword of the Stars II is finally playable, but still hobbled by bizarre design decisions. Sword of the Stars II was released last year in such a shockingly unfinished state that the developers issued a public apology. Thirteen months later, and this ambitious 4X space game has been allowed to boldly go for a second time. Sadly, while the bugs are (mostly) fixed, the game remains deeply frustrating. You start off by choosing from a variety of finite 3D galaxy maps to conquer, and one of seven races to play as. Each race is unique in the way it moves around the map, and its particular strategic strengths. The avian Morrigi specialise in trade, and have ships that move faster through space when grouped in large fleets. By comparison, Enhanced Edition newcomers the Loa are a race of sentient AIs that build sequences of relays between stars to speed up their movement, and use nanotechnology to pool their ships, rebuilding and adapting them as required. 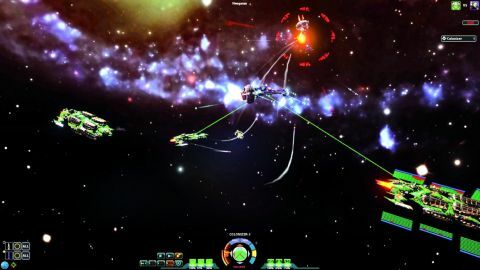 Play alternates between the turn-based galaxy map and real-time battles, and there is a range of victory conditions, including last-man-standing and conquering a certain percentage of the map. However you play, the basic game is the same. Fleet movement is separated into missions that can be assigned to individual fleets. Survey missions reveal any habitable planets in a solar system, and how expensive terraforming one with a colonisation fleet will be. Once a colony is built its population and income will increase, and you can also send construction fleets to build space stations around them, from naval outposts that defend planets and expand the range of fleets to civilian orbitals that enable trade and diplomacy. When opposing factions are encountered, you can send fleets to battle in single-turn 'Strike' or longer 'Invasion' missions. During battles, a more conventional RTS control system is adopted – left-click to select ships and right-click to move and attack. Ships can also spin and roll to either avoid enemy fire or take hits in less damaged areas. On top of all this is an extensive, semi-randomised tech tree to be researched, and the capability to design your own ships, all of which sounds very enticing. And it would be, except these systems appear designed to make the game as slow and unintuitive as possible. It sorely lacks a comprehensive, playable tutorial, and the UI is more difficult to navigate than an asteroid field: menus upon menus with tiny, illogically placed buttons. It took me half an hour to figure out how to place a space station near a planet. When do you crack through the game's outer shell, the resultant experience is inflexible and grating. The mission system is completely arbitrary, severely hindering the game's strategic potential. You can't combine a survey/colonisation mission, or change a fleet's course to respond to an enemy invasion. You can't react on the fly: everything must be done separately with no room to change your mind, and it slows the game to a crawl. Battles meanwhile are limited to a maximum of 12 minutes, which initially sounds like a smart idea, but means many conflicts end in a draw. It's also selective in the information it provides you with: damage, for example, is indicated on your ship but not on the enemy's. Oh, and the button for rotating the camera during battles also controls ship movement. Imagine if humans moved their legs by blinking: it's that counterintuitive, and that annoying. Kerberos have had a year to get this shipshape, but aside from a few patches over holes, Sword of the Stars II is the same ponderous vessel.